It provides two kinds of design elements: free ones or the ones used for business. It allows the users to customize icons, shadow, fonts and other things as well as making animated page transitions the way they want it without the need of any graphic software mastery. This platform offers a vast variety of keynote templates (as many as fifteen thousands, to be exact) for personal use and different business sectors, like corporate business report, management and accounting. Motagua can indeed be considered to be one stop solution for complex animated templates with 16 different color themes and full HD 3 aspect ratio. In addition, not only are they embellished with unique layouts, but they are also equipped with infographics, photo galleries, subtle effects, numerous color choices, and multiple visual options. Quite similar to other platforms, Ever helps its users create presentations for various business sectors: technology, finance, creative industry, etc. Not requiring downloads of other computer programs, this platform is the perfect for those who are simply looking for editable templates with customizable shapes and colors. Ever provides hundreds of multipurpose slides so there is a big chance that your creative needs are going to be catered well. Highlighting the real use of presentation templates, Kaspian ensures readability templates with just the right amount of visual details. Even the good quality animation and use trendy colors it provides can make your presentations more attention grabbing and dynamic. Mind you, this keynote template creator is serious about providing its users with plenty choices: over one hundred slides and fifty infographics as well as some mockup options. Serving as a multi purpose keynote template provider, the platform is dedicated to accommodate different commercial sectors: corporate, organization and creative sector. Some of its various options are the ultimate gradient style and easy customization. Focusing on creating unique and stimulating templates, this platform has been recognized to be the number one keynote template provider on Envato Market. This guarantees professional template of high flexibility. With the availability of two thousand vector icons, vast options of graphs and infographics along with 200 unique slides, you can come up with an original, inspiring presentation. Another benefit of using this platform is that the visual elements can be edited without the need of Photoshop or Adobe Illustrator. Quite simple compared to some other keynote template platforms. In fact, it offers the best solution to introduce business plans to clients, portfolio collection, investment pitch, financial and marketing plan, market analysis, project updates, and other business endeavors. This website gives its users more than 300 presentation slides, maps, charts, trendy slides for both text and images to choose from. Using modern designs, it produces professional looking keynotes. Its users will also experience easy to use and edit templates as editing tutorial is provided for guideline of easy customization. Best Multipurpose Presentation Template features Keynote slides for Business Success, SEO, Online Marketing and Marketing Strategies. Those seeking to create effective presentation will love the ones provided by Rework. By using 16 master slides, its users usually spend less than thirty minutes on creating the templates. Such time efficiency is the result of their features known as basic animated effects and placeholders. Considered to be in the top ten list of presentation template makers in 2017, it sets a good example of how good keynote templates should be. 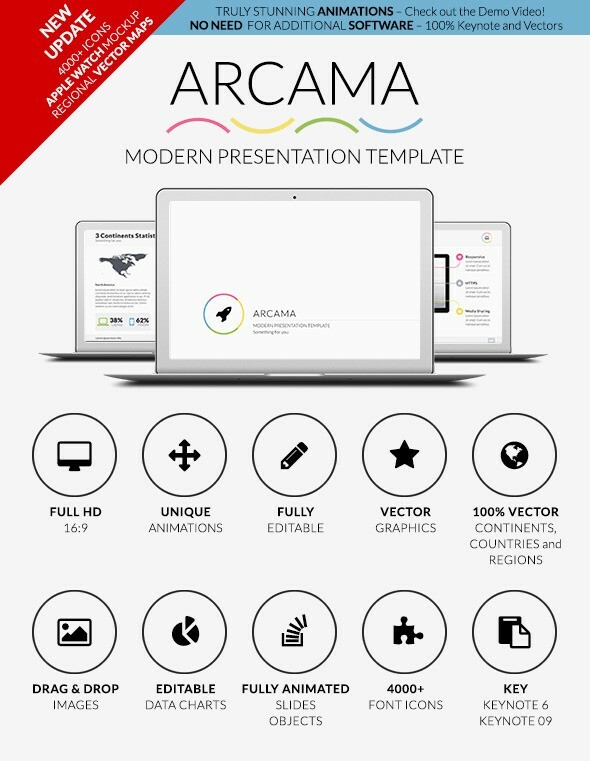 Equipped with over 4000 font icons world maps of high accuracy, and 9 infinity graphics, this template creator can help you to design a sleek and memorable presentation. These ten template creators can make the preparation process of your presentation take less time. While some free services are available, the premium ones can give you better control, which means that you get to let your creative flair loose, customize a lot of things and make the presentation more personal and suitable to your needs.